It’s time for Friday Five again! And even though today is National Donut Day, the lovely ladies in the DC Trifecta (Mar, Cynthia, and Courtney), decided that they’d like to talk about National Running Day. Personally, I’d rather talk about my five favorite donut flavors (chocolate cake donut, chocolate filled donut, chocolate frosted donut, anything else covered in chocolate), but ok, I’ll talk about running. Since I’m about to start training again, here are the 5 things I love about training for the half marathon or longer. 2. New running shoes. I love new shoes and I always start off a training cycle by adding a new pair to my collection. This time I have my eye on the Altra One 2.5 (affiliate link). I LOVE the 2, but I’ve heard the 2.5 is even more amazing, so yeah, that’s my next shoe. 3. New running clothes (or in my case a new Skirt Sports skirt. (affiliate link)) Yeah, I’m gonna go there. Never mind that I own a ** skirts. No, I’m not sharing how many. But there are still three patterns in this spring’s collection that I need and I obviously need a new outfit for Marine Corps. After all, it’s all about that skirt! 4. The sense of accomplishment. I may not always love running long runs, but I love how I feel when they are done. I like the feeling of being tired and having used my mental strength to get me through. At least I do once I get home. Not a huge fan of it in the middle of the run. 5. Did I mention donuts? I know I need to watch what I eat. It’s super easy to gain weight during marathon training (although last time I managed to gain it before I started and then couldn’t lose it during, sigh.) Still, if I run 3-4 hours, I’m gonna have a donut. 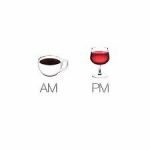 Or a beer. Maybe both. I guess I should actually sit down and figure out what training plan I want to use. 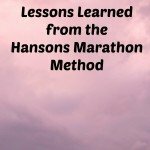 I’m a Hal Higdon girl, but I like the idea of the Hansons plan and I feel like I can start at fairly high mileage if I start running again soon. 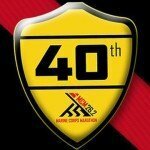 Do you like training for long races? Or are you more of a fan of short and fast? Mmmm, donuts and beer. I just signed up for a bicycle race that involved binge eating donuts and uses a combination of your cycling time (36 mile course) and number of donuts eaten to calculate the winner. I have to be careful I don’t get too carried away on that training plan!! oooh and NUMBER ONE IS WHY I NEED TO WALK MORE HALFS!! less the silent child and more the girlfriend time. CARLA recently posted…Why Im glad my daughter is an athlete (guest post). I love long distance! But, I think I’m going to focus on my fastest 5 or 10k for a while. We’ll see how long that lasts. Mmm, salt and vinegar chips. Yummy! I’m all about new shoes and new running gear. Family members don’t really have to ask what I want for Christmas or birthdays. Gift cards or cash that I can use to buy running gear is always on the list. Same here. I usually just buy what I want and give it to Beer Geek to give to me at Christmas. Saves time with having to return things LOL. The sense of accomplishment is one of the best feelings ever! Erika, I love training for long races…then I get to have more shoes – hahaha! Oh, and running clothes, too, of course! Are you enjoying a donut today for National Donut Day? How can you miss that one? Hope you have a great weekend! 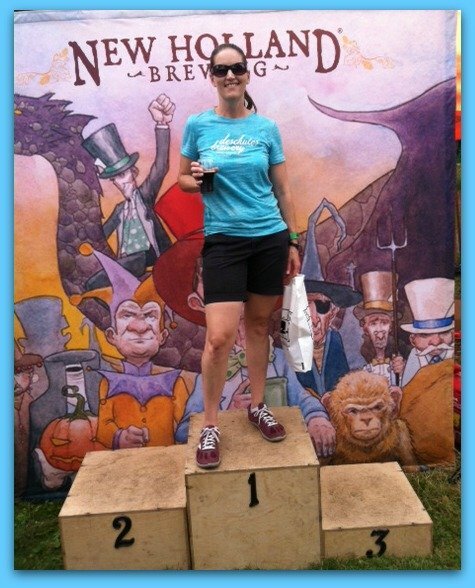 Tara @ Running ‘N’ Reading recently posted…National Running Day 2015! 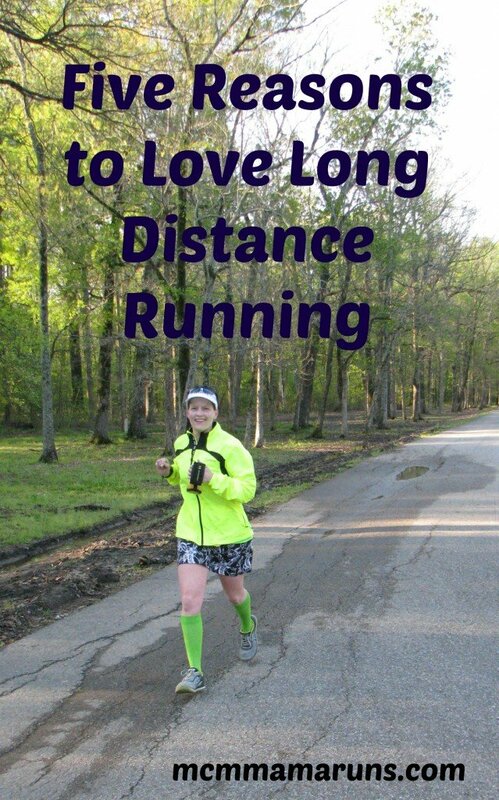 I never even thought I would run a longer race, so my long runs are such an accomplishment. Of course I like the short an fast ones too! Yup. I totally get this particular brand of crazy. Sometimes the long runs of 18 plus miles get on my nerves but mostly just because I get bored! Great post. Yeah, I prefer to do long runs by myself, so I get bored sometimes. I just worked on my training plan yesterday – can’t wait to hear more about yours! I’m leaning towards Hanson. I need more days because I have another series coming up, and they are a 5-6 day plan. All of the above, except shoes. Although I did get excited that my shoe Brooks Ravenna 6, just came out in new a new and fabulous color. I’ll add that my daughters LOVE the medals and I love showing them that hard work and dedication is rewarded. I love new color shoes. I can so relate to the shoes and clothes. I’m sitting here at 3:30 am almost excited to go for my 37k run because I have a new running top. And it’s really cute! yes to all of the above especially buying new shoes and skirts of course! Haha we all need an “excuse” to buy a new Skirt or compression socks, or shoes, shirts…this list could go on allll day. I “needed” more compression this weekend. You mentioned donuts, but I didn’t see anything about beer! Beer with my donuts. ;o) And I drink beer even when I’m not training. Love all of these reasons! I wasn’t a big fan of long distance running at first but now I enjoy it. I do love the high mileage as an “excuse” to buy some new running gear! 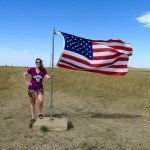 I spent my first two years of running training for the distance. This year, after my marathon, I focused for the first time on the 5K. I don’t think I’ll ever be “fast” by regular standards, but I have worked hard at improving my speed. Now that’s summer, it’s time to go long again. I was just thinking I’m kind of bummed I need to start marathon training because I’ve been running fast lately and kind of like it. But as it gets hotter, I’ll be happy to go slower. I think those are all GREAT reasons. My favorite distance is the half. It’s just the right amount of long, without the aftermath of a marathon. Yet, it’s also super tough especially if you’re gunning for a time goal. I mostly run half marathons. 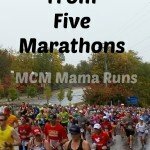 This year I’m running three full marathons. I doubt I’ll do that again after this year. Yes to number 5 ! Too funny and fully agree. One must have the occasional treat, right??? A beer flavored donut! You know…both are made with yeast. It’s a win-win. Hmmm… I think I’d prefer a donut flavored beer. I’m in love with the long distance but I think my body needs a break. I think after MCM I need to focus on some shorter distances! 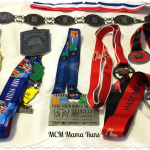 Sue @ This Mama Runs for Cupcakes recently posted…Thinking Out Loud: Yes, I’m still alive….